The Ballroom at Ellis Preserve is mostly white inside, and you can change the mood with one of their many uplighting colors. This winter wedding had purple uplighting, and silver sparkle tablecloths. 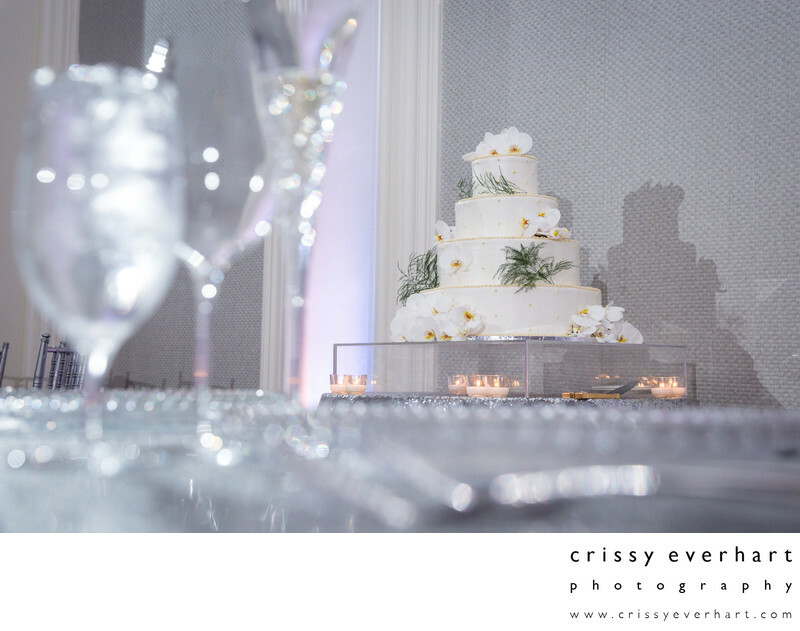 The glassware of the table settings is in the foreground, and the cake is in the background, decorated with white orchids and sprigs of greens, atop a clear acrylic cake stand. Ellis Preserve in Newtown Square is a perfect spot for your modern wedding. The decor is customizable, but everything is clean, simple, and contemporary, with respects to classic architecture. The front entrance has large columns and a stone staircase, and the entryway has white marble floors with a large room for cocktail hour. It is in Newtown Square, close to Philadelphia, right on the border between Chester and Delaware Counties. Location: 3821 West Chester Pike, Newtown Square, PA 19073.